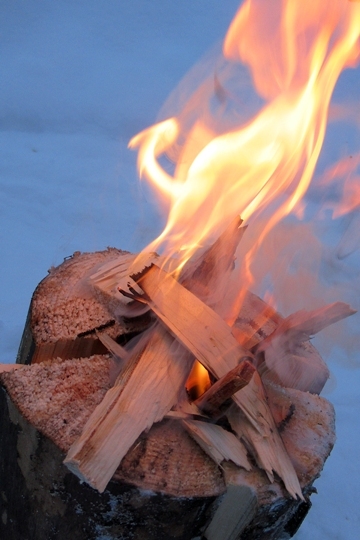 A Swedish torch (also known as a Swedish candle, Swedish fire log, or Schwedenfackel) is a very practical alternative to a traditional campfire. With a little prep work, they are easy, efficient, and require little resources and little tending. 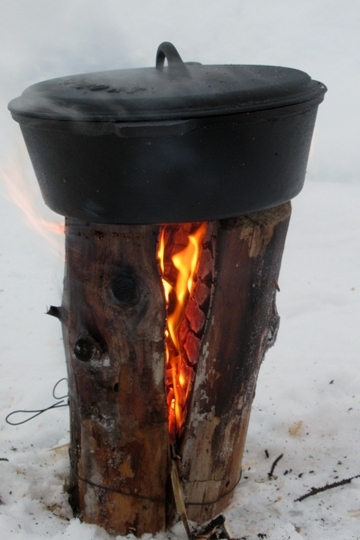 They are particularly nice if you are winter camping, have wet ground, or a limited supply of firewood. If you are the kind of person who enjoys cooking over a campfire, a Swedish torch makes for a very easy cooking heat source with directional heat and a quick start (versus waiting until coals cook down). The Swedish torch dates back to the early 1600s when Swedish soldiers used them as heat and light sources and for cooking during the Thirty Years’ War. The Schwedenfackel—a medieval term—were used to conserve firewood that was scarce and heavy to haul. One log would last several hours, burning from the inside outward and requiring little tending. 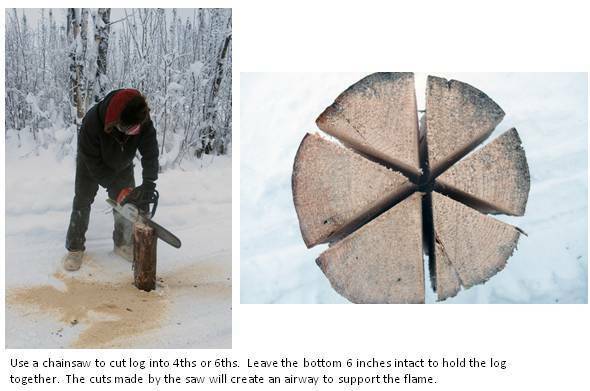 The Finnish Raappanan Tuli fire is very similar, but uses a log cut only in half, requiring a larger diameter log for stability. To make your own, start by being sure you are in an area where it is OK to have a campfire and no current fire restrictions or bans are in place. Be sure you have good fire safety procedures and tools available. Find a safe ground location and clear all other flammable material well away. Find a dry, seasoned log about 2 feet long and a decent diameter (at least 6 inches or so). Green wood (recently cut) won’t work as there is too much moisture in the wood to keep the fire going. Make sure the ends of the log are flat. This gives a stable base to the log and a flat surface for cooking. Using a chainsaw*, cut lengthwise down the center of the log making 2-3 slices as you would cut a pie into quarters or sixths. Do not cut all the way through the end of the log; leave about six inches at the bottom uncut to hold the slices in place. 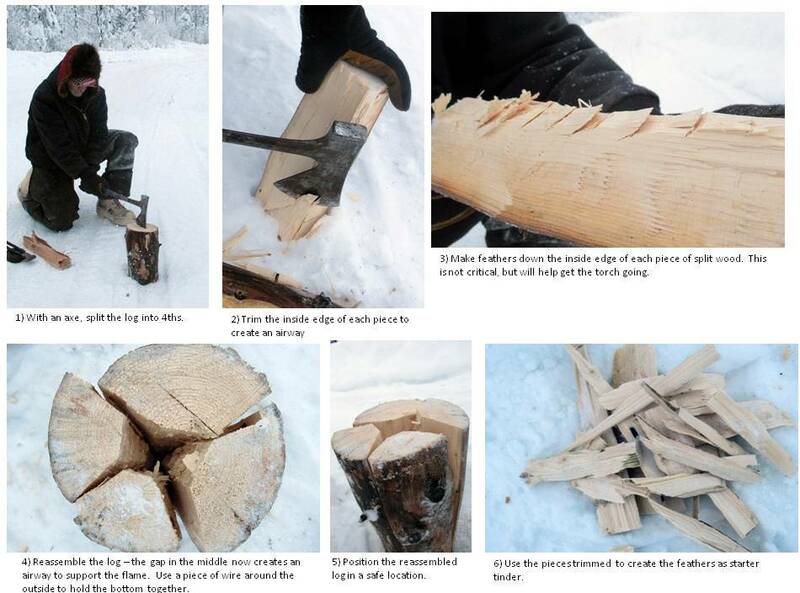 *Note: If you don’t have a chainsaw or wish to be more of a historical purist, you can also use an ax and cut the log into wedges, then reassemble the log using a piece of wire around the circumference to secure the pieces. The Swedish soldiers in the 1600s did not have chainsaws, after all. Situate the log in the location you want it to burn. You can dig the log into the ground a few inches if you need additional stabilization. If you will be cooking on the log, make sure the top is flat. Start a small fire using tinder on top of the center part of the log. Continue to tend this fire with small bits of kindling until coals start to form and fall into the center of the log. You can use a stick to poke the fire down into the center as it burns, just take care not to block air flow through the wood. You can help it along by blowing gently through the cracks in the lower part of the log to get the chimney effect going for optimal airflow. Keep feeding the fire kindling in the log until the log catches and starts burning on its own. The log will continue burning from the inside and out the top. Once the inside starts burning, you may see flames shoot out of the top of the log like a candle. Get out the cast iron skillet, Dutch oven, or teapot and cook your meal while you enjoy the pleasant heat and light produced by your Swedish torch! As with any open fire cooking, don’t forget a lid for your cookware unless you are ok with some fire ashes in your dish. 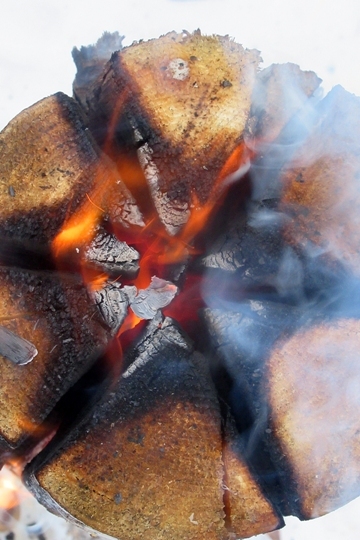 Depending on the type of wood, how big around, and how dry your log is, it should keep burning on its own 2-4 hours without needing to be tended. Remember to be sure to extinguish your fire completely (out COLD) when you are done enjoying your fire! Happy camping! We’ve often also taken advantage of naturally hollow logs to a similar effect (chimney fire logs). Also looks cool and like a lot of fun!